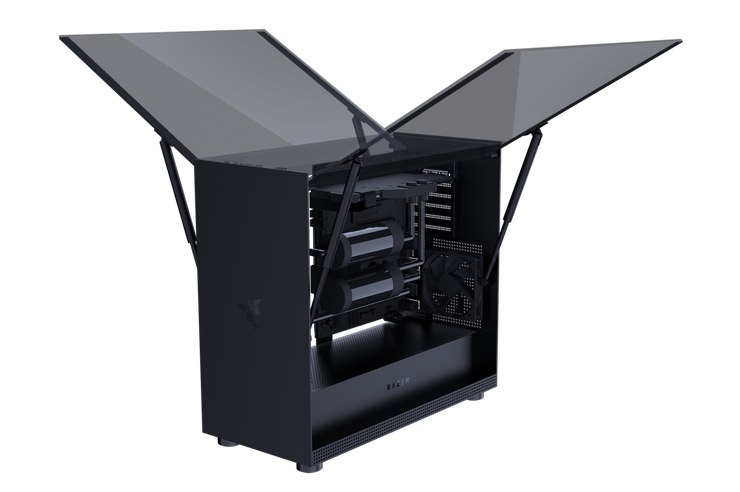 The company say the new cases are the first PC gaming chassis they've developed in-house. The regular Tomhawk boasts a traditional mid-tower form-factor and supports ATX motherboards. Then, the Tomahawk Elite is a larger case designed to support larger and more high-end components. The Tomahawk Elite is a Razer product, so obviously the case integrates with the company's Chroma Lighting ecosystem. Since Razer have now begun opening up that ecosystem to third parties, that means the Tomahawk will be able to synchronize and build on the cases' RGB lighting with compatible components. As seen in the pictures, the Razer Tomahawk Elite features winged, tempered glass panels on the sides that can easily be pulled open to allow easy access. Again, it's more heavy duty. No word yet on Australian pricing or availability but we expect to hear more sooner rather than later.